Prime Minister Sheikh Hasina on Sunday urged the leaders of All European Awami League to give a befitting reply to BNP-Jamaat’s propaganda abroad against Bangladesh and the government. The Prime Minister made the call while addressing leaders of Awami League from different countries across Europe as they met her at her hotel suite in London. After the meeting, Prime Minister’s Press Secretary Ihsanul Karim briefed reporters. He said various issues on strengthening the organisations were discussed during the meeting. Hasina said BNP and Jamaat have huge money earned through corruption and they are carrying out a negative publicity against the government by capitalising their illegal money. 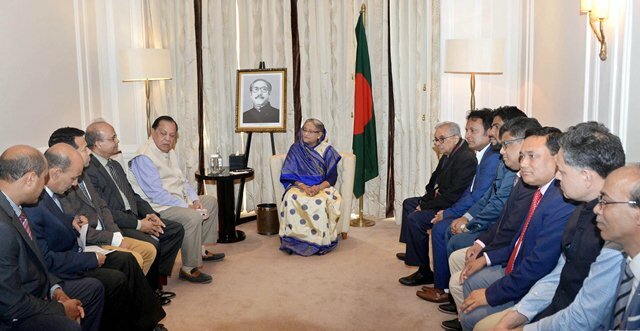 The Prime Minister directed the leaders of Awami League to maintain unity and gave necessary directives on further strengthening the organisation. Hasina said she had endured huge pain and sacrificed a lot only for the cause of the country and welfare of its people. As a party of people, she said, Awami League has to move ahead by working hard through coordination among senior and junior leaders. Recalling the huge contributions of the senior leaders in Europe after the brutal assassination of Bangabandhu in 1975, the Prime Minister said she still remembers their strong role during bad times of the party. The Prime Minister also put emphasis on showing due respect to the senior leaders saying their experience and sacrifices would encourage juniors to go further ahead towards meeting aspirations of the people. President of All European Awami League Anil Das Gupta led the delegation came from Austria, Belgium, Sweden, the Netherlands, Spain, Italy and France.